Here we display an absorbed power-law fit to a PHA source counts spectrum, along with the fit delta chi residuals (data-minus-model counts residuals normalized by their errors). For detailed information about each of the steps in the script, see the Sherpa thread "Introduction to Fitting PHA Spectra", which also contains links to the ahelp files for each Sherpa function used. Here we display a simultaneous fit of four source-plus-background ACIS-S/HETG grating spectra, with the source modeled by an absorbed broken power-law, and the background modeled by an absorbed power-law. title "3C 273 (ObsID 459)"
d 1 label 12 0.075 "HEG -1"
d 2 label 12 0.075 "HEG +1"
d 3 label 12 0.125 "MEG -1"
d 4 label 12 0.125 "MEG +1"
For detailed information about each of the steps in the script, see the Sherpa thread "Fitting Grating Data", which also contains links to the ahelp files for each Sherpa function used. 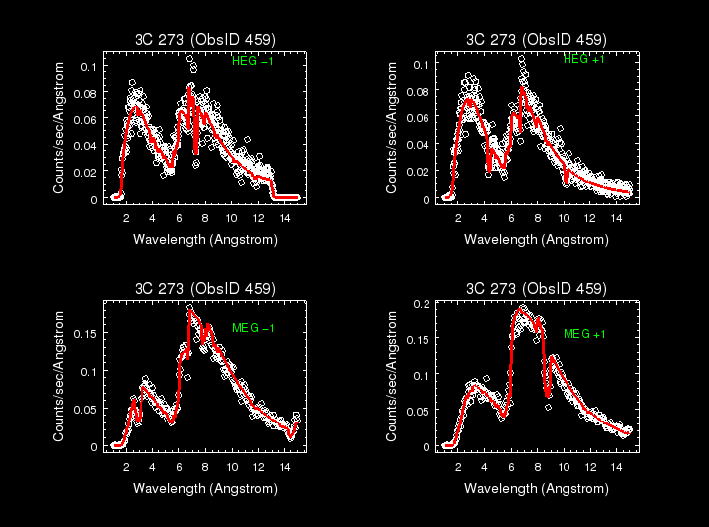 Here we display the unresolved -1 HRC-S/LETG spectral order fit with the high-resolution model components corresponding to the -1/-2/-3 HRC-S/LETG spectral orders. 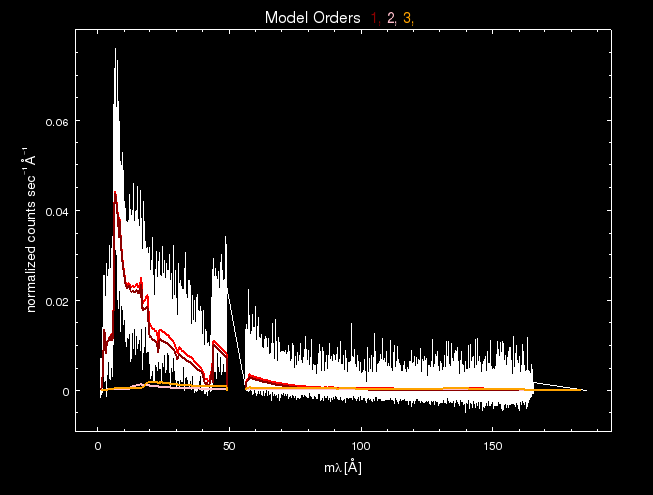 This results from a simultaneous fit of the +1/-1 background-subtracted HRC-S/LETG source grating spectra, with the source modeled by the XSpec version of an absorbed broken power-law. d 1 label 125 0.04 "Model orders -1, -2, -3"
For detailed information about each of the steps in the script, see the Sherpa thread "Fitting Multiple Orders of HRC-S/LETG Data", which also contains links to the ahelp files for each Sherpa function used. 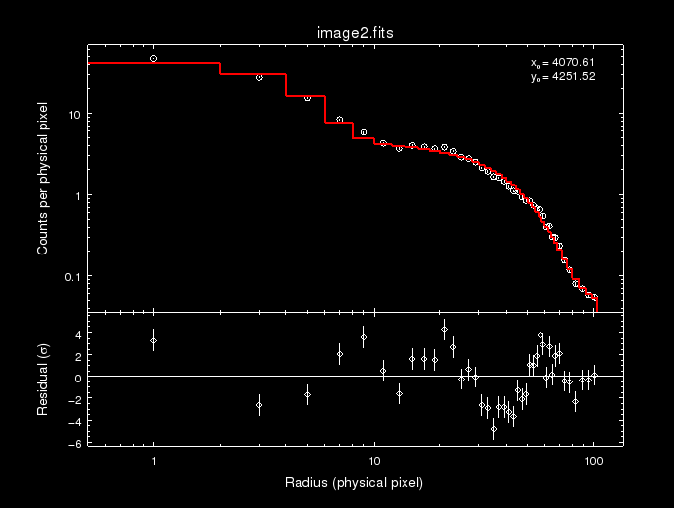 Here we display the data-to-model ratio image of a 2D PHA source data set in DS9, Sherpa's default imager. 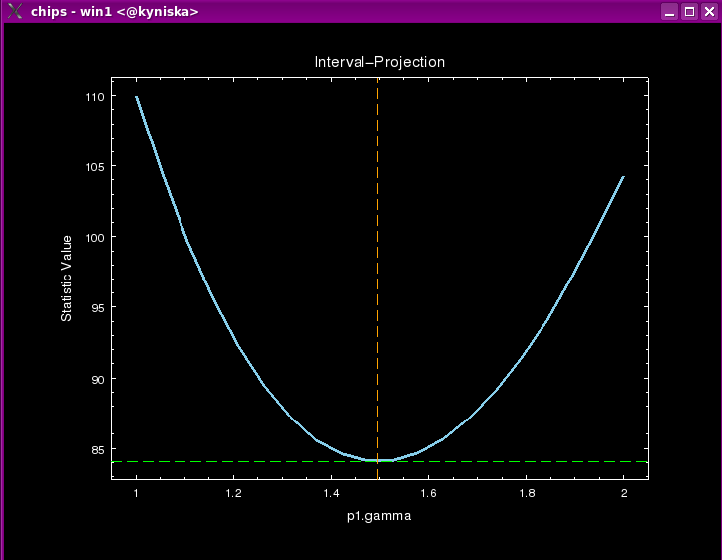 The multi-component, source-plus-background model expression used to fit the data is the sum of two 2D Gaussians (bulk and core emission) and a constant (background). For detailed information about the steps in the script, see the Sherpa thread "Fitting FITS Image Data", which also contains links to the ahelp files for each Sherpa function used. 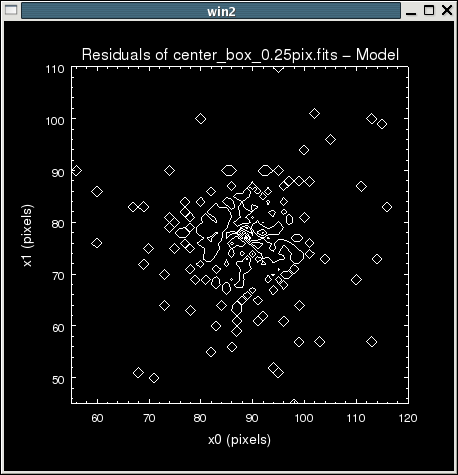 Here we display the radial profile of a 2D PHA data set, for which the profile center, ellipticity, and position angle are determined by source model values, and the bin width and radial extent in pixels are taken from the data. 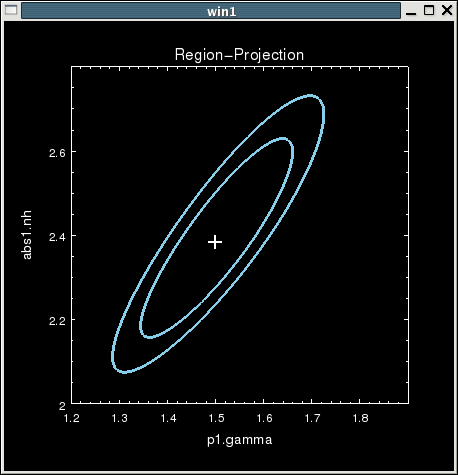 The model fit to the radial profile with delta chi residuals is also shown; the source-plus-background emission is modeled by the sum of two 2D Gaussians (bulk and core emission) and a constant (background). For detailed information about each of the steps in the script, see the Sherpa thread "Radial and elliptical profiles of Image Data." 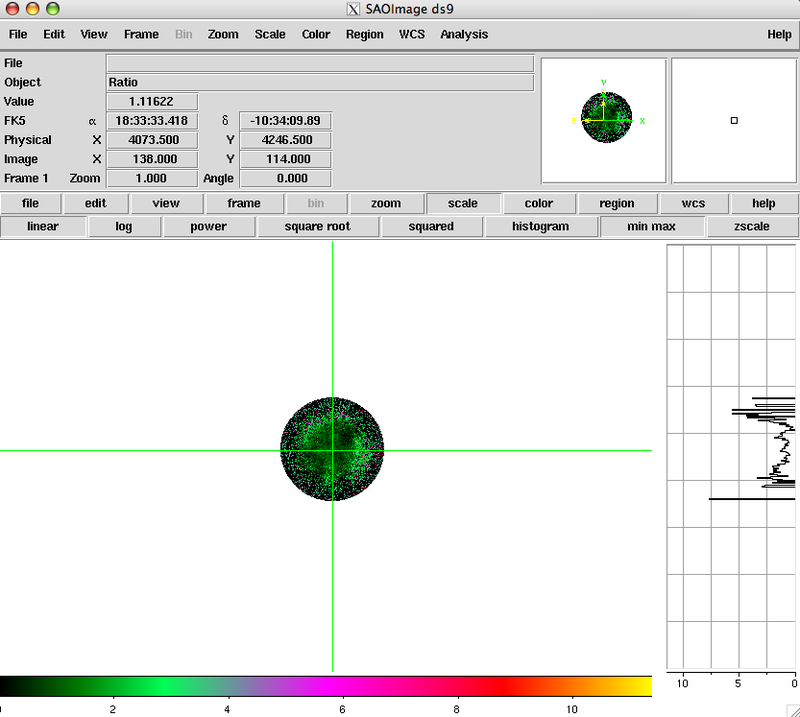 Here we display a 1D Beta model fit to a background-subtracted radial profile extracted from a 2D PHA data set (either spatial table or image file) with the CIAO tool dmextract. For detailed information about the input data in the script, see the CIAO thread "Obtain and Fit a Radial Profile." 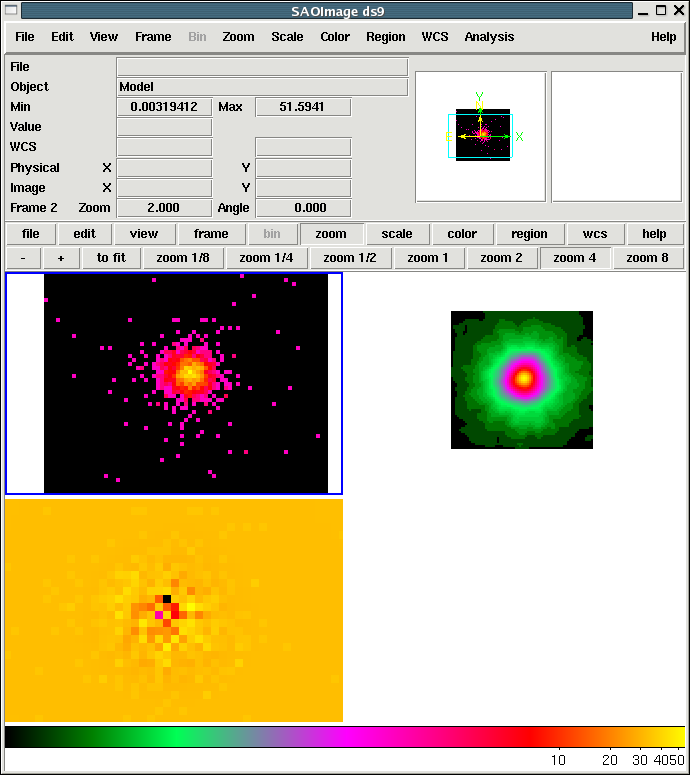 Here we display three images in one DS9 window: the counts image of a 2D PHA source data set, the corresponding 2D PSF-convolved model to be fitted to the data, and the counts residuals (data-model) of the fit. The multi-component source-plus-background model expression is defined by convolving a PSF kernel read from an image file with a 2D Gaussian plus constant model. For detailed information about the steps in the script, see the Sherpa thread "Accounting for PSF Effects in 2D Image Fitting", which also contains links to the ahelp files for each Sherpa function used. Here we display a contour plot of the counts residuals (data-model) resulting from the fit of a PSF-convolved Gaussian model fit to a 2D PHA source data set (see the fitting example DS9 counts images of data, PSF-convolved model, and fit residuals for model details). For detailed information about the steps in the script, see the Sherpa thread "Accounting for PSF Effects in 2D Image Fitting." 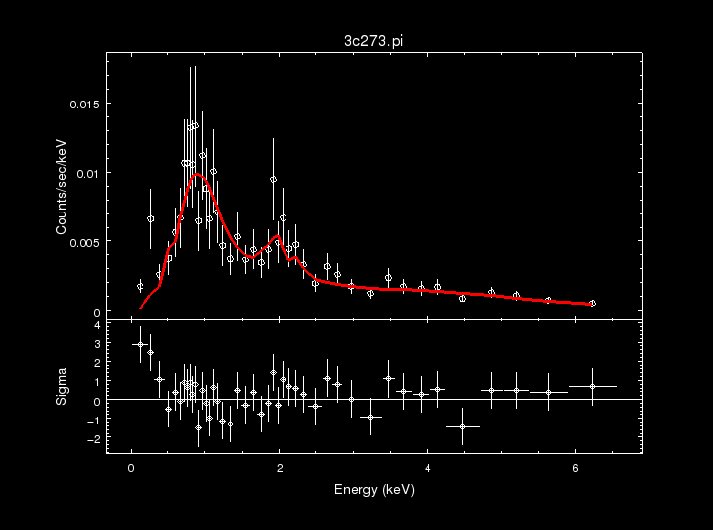 Here we display the confidence plot for a particular model parameter after finding the best-fit of the model to a 1D PHA source data set. 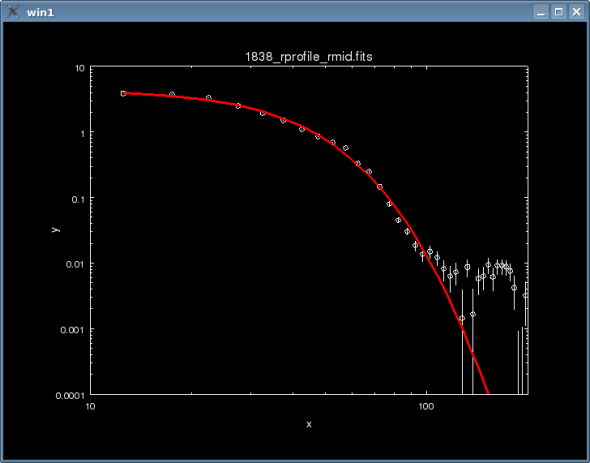 The minimum of the parabola corresponds to the best-fit value for this particular model parameter (lowest chi-square fit statistic), while the arms of the parabola demonstrate how the chi-square fit statistic varies within the 90% (1.6 sigma) confidence bounds of the parameter value. For detailed information about the steps in the script, see the Sherpa thread "Step-by-Step Guide to Estimating Errors and Confidence Levels." Here we display the confidence contour plot for two different model parameters after finding the best-fit of the model to a 1D PHA source data set. The center point of the ellipses corresponds to the set of best-fit values for the two model parameters (where the chi square fit statistic is at a minimum), while the inner ellipse represents the 68.3% (1 sigma) confidence bounds on the correlated values, and the outer ellipse the 90% (1.6 sigma) bounds. The chi square fit statistic varies along the axis perpendicular to the plot (i.e. out of the screen).